If you say that you like beets, you were likely raised in the U.S. This is not because beets are exceptionally popular in the U.S., but rather because Americans are the only people who call them beets. Everyone else calls them beetroots. So if you’re traveling overseas and see beetroot on the menu, you now know what to expect. Beta vulgaris is a widespread vegetable with a variety of forms and functions. The familiar roundish, red-rooted variety is known as a table beet. It is raised primarily for its root, though the leaves are edible, especially when the plant is young. The delightful variety of beet grown for its leaves is commonly known as chard or Swiss chard. The sugar beet can be eaten, but is cultivated primarily for obtaining sugar. Finally, the mangel-wurzel, also called the forage beet or field beet, is grown as food for cattle. Beets most probably originated in Italy, but spread to other parts of the Mediterranean region in prehistoric times, so it’s difficult to place their point of origin precisely. In the earliest days of the Roman Empire, only the leaves were consumed, though beetroots had been added to the Roman menu by the beginning of the Christian era. 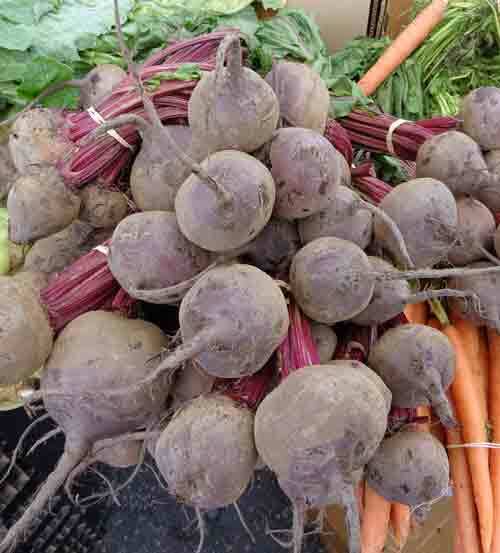 Beets spread unevenly, primarily moving north, where they throve in the cooler temperatures. Though Charlemagne knew of beets and wanted to see them grown in his domains, there was no real beet presence in France until their introduction (or reintroduction) during the Renaissance. Because beets tolerate fairly high degrees of salinity, they also became popular in countries near salt seas or, more especially, that were reclaiming land from the sea. The rise of the sugar beet is easier to trace, because it occurred after sugar started to increase in importance. The process for extracting sugar from beets was developed by a German chemist in the mid-1700s. It was easier to extract sugar from cane, but cane only grew in tropical climates, and beets liked it cool. Even so, the beet sugar industry didn’t explode until Britain blockaded Napoleon’s France, cutting off access to imported sugar. Napoleon ordered that 70,000 acres be planted with sugar beets, and French financier Benjamin Delessert opened a processing plant, and soon France was independent of outside sugar sources. Even now, about one third of the sugar in Europe is beet sugar. However, it is still the table beet that is the more familiar and widely grown beet variety, especially in colder or saltier regions. Still, the most commonly encountered beet for most people is the table beet. They are beautiful when roasted, but also delighted when pickled, and even simply simmered they’re not bad. I frequently add canned matchstick-cut beets to coleslaw, as they brighten and add nutrition. Because beets are true nutrition powerhouses. They offer antioxidants and are anti-inflammatory, and current research is looking into possible anti-cancer advantages. However, as with all vegetables, don’t overdose. Virtually everything with benefits also has some side effects of taken to the extreme (as has been occurring in recent months with kale). And be advised — the red color in beets is “persistent” — that is, it doesn’t vanish when you digest it, so if you eat a lot of beets, you might think you’re bleeding to death when you go to the bathroom the next morning. You’re not. It’s just the beets.